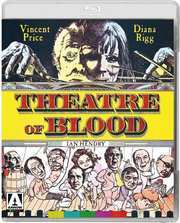 Before we head off into the long Easter weekend, a quick note that Vincent Price has reserved a seat for you in the Theatre of Blood, turning up on 5th May courtesy of Arrow Films. This 1973 British comedy horror classic will carry a recommended retail price for the Blu-ray version of £24.99, and £29.99 if you plump for the steelbook release. It co-stars Diana Rigg, Ian Hendry, Harry Andrews, Arthur Lowe, Robert Coote and Coral Browne. Newly restored, it is presented in its original 1.66:1 aspect ratio with a mono soundtrack, has Optional English SDH subtitles for the deaf and hard of hearing, audio commentary with Jeremy Dyson, Mark Gatiss, Steve Pemberton and Reece Shearsmith, interviews with Victoria Price, film historian David Del Valle, star Madeline Smith and composer Michael J. Lewis. It also includes a reversible sleeve featuring new artwork by Sam Smith and a collectors booklet with new writing on the film by critic Cleaver Patterson, plus a reproduction of the original press book material, illustrated with original archive stills. Plus, of course, a trailer. It's never been tougher to be a critic than in Theatre of Blood, one of the greatest horror comedies of all time. Price gives a career best performance as Edward Lionhart, a veteran Shakespearean actor who, when passed over for the coveted Critic's Circle award for Best Actor takes deadly revenge on the critics who snubbed him. With one of the greatest ensemble casts ever assembled for a horror film this is a dementedly funny and deliciously macabre cult classic.